The online support group for esophageal cancer that I belong to consists about equally of patients/survivors and their caregivers, most of whom are spouses. About a week ago, one of the caregivers, Chris, posted an update on her husband, along with a story. 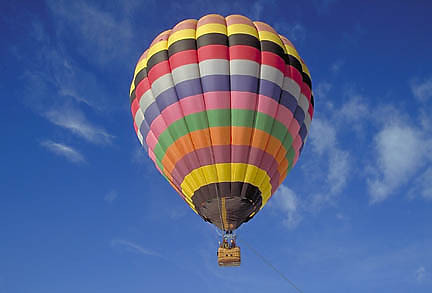 here……I gave Jim a hot air balloon ride for his 49th birthday on 7/18. help. As far as I know, there was no discussion with him about Jim’s cancer. I really like your story about the balloon ride. I wouldn’t argue with your interpretation of the significance of the young man’s name, but I can also offer an alternative speculation on the subject. Since, as you know, not everyone who is named for Jesus is actually He Himself, it may be that this was an angel who called himself Chris because he was summoned by Chris P’s love and concern. Paul, I love the alternative speculation you present! And, yes, you may repeat our story on your blog…… I would be honored. I feel that one of the “reasons” Jim and I are going through this journey is so we can let others know of the love we receive throughout the whole thing. And from now on I will be reading your blog. At first glance, it looks like something I’ll love. First of all, I should say that, no, Chris and I aren’t crazy, we’re just very open-minded. These things could be … I don’t insist … It’s fun to speculate, but I’m not at all certain that this sort of angel actually exists.The sort of angel I am confident of is made of flesh and blood; it is a human being who is willing to follow the leadings of love, even when that amounts to no more than a faint tickle in their mind, a gentle prompting they cannot explain. That may be enough to explain the actions of the young man named Chris. (Perhaps, in response to Chris P’s loving concern, God asked, “Let’s see what assets I have nearby … Oh, yes, there’s young Chris, I can count on him to follow my suggestions – and the coincidence of his name is sure to get people talking! I’ll send him.” OK, I don’t insist on this. Just thinking. )So, what can I say about this with conviction? First, look at Jim, the guy we almost forgot about in all of this. Here he is, as sick as anyone ever ought to be – maybe sicker than that – and he is, none the less, living joyously, making life worth the trouble. His sense of community (love f neighbor) is keeping him working, doing his part, pulling his own weight, even when he could fairly claim an exemption, and probably should. Then, there’s Chris P herself – bringing the sweetness of birthday celebrations and balloon rides into her sick husband’s life, standing back and watching with concern, trying to walk the line between helping and interfering – doesn’t this sound like how God actually works in our lives? Is she a stand-in for God, an angel? And why not? Haven’t I said (here and here and a few more places) that we are one with God and each other, even while we are different and unique? So why can’t we stand in for God, why can’t our love summon help from other loving beings? We don’t have to believe that God exists, and we don’t have to believe that winged and haloed angels exist; we just have to believe in love enough to trust its small requests. All of us who are or have been sick, save a very few unfortunates, have our caregivers, our angels. Caregivers are most often spouses, but they may also be children, siblings, in-laws, friends, whatever. Then, we get to reciprocate, or pay it forward, caring for others. We also act as caregiver to the caregivers, supporting those who have drained themselves for others. We form a web, a community, an unbounded unity. What I really wanted to say, is just how grateful I am to my wife, my family and friends, and everyone else’s caregivers; your efforts on our behalf keep us alive longer than we had reason to hope for, and your love makes our troubled lives sweet. This entry was posted in Cancer, Found Stories, Religion & Spirituality, Something I Read and tagged cancer, community, esophageal cancer, friends, friendship, love, spirituality. Bookmark the permalink. That was a beautiful entry, Paul. I’m honored that you told our story and love the rest of what you did with it. Paul, I am a friend of Jim and Chris’. I am so honored to have them in my life. Paul, please know, all of you who are fighting the fight, walking the walk and survivors are true heroes (even though you may not consider yourself a hero and that you are just doing what one has to each day). Paul, you and yours will be included in my prayers.